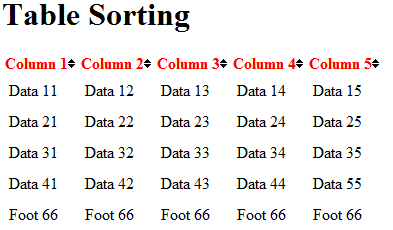 Table sorting is a very common polishing feature that you’ll see for most tabular data. In ASP.NET you get functionality with this out of the box with a control like a GridView, but requires a full postback just to sort data that is already presented on the screen (unless your in an update panel – but even still, seems like a lot of work when you have all the data). That is when client side table sorting enters the picture. This makes for an especially nice user experience and reduces development time in worrying about having to sort data server side. This also reduces load on your server by minimizing the number of postbacks required. The documentation suggests its compatibility with v1.2 of JQuery. I have personally confirmed it works in JQuery 1.3.2 and 1.4.2 (the newest version). So no worries with those versions. <thead> – This will be recognized as being a clickable cell that will sort the rows beneath it. <tbody> – This will be recognized as rows that are ready to be sorted. <tfoot> – This will be recognized as rows that should not be sorted – i.e. footer row for grand total, etc. // this column is a standard text column. // which would allow it to auto detect. // disabled the sorting completely on this column. There are a couple of things going on in the above example. First, we add a new parser to the Tablesorter repertoire. Then we initialize the Tablesorter headers by column number (starting at 0). You simply specify the Tablesorter parser to use. Optionally, you can specify “false” and this will prevent sorting on that column. The final “sortList” property specify’s the default sorting column and secondly the order (0=asc, 1= desc). This is nice since then you don’t have to specify each columns data table. You could potentially have a text extraction method that looked for and removed things like “KM”, “CM”, “%”, anything you wanted. Then when a new column is added to your table it is automatically sorted without the requirement of you to change the code. I like using textExtraction where possible, but for where you need further granularity or specialized business logic you can use the custom parsers above. Where, in the above line, the ReportGrid is your GridView.